We've been telling you a lot about music, audio formats, and various loudspeakers, but we never mentioned what speakers our VOX Team uses every day. No silence. As soon as somebody comes to our office, they start playing their music. Sometimes we have disputes on what our mood is and what to listen to, but there's always something playing. Only HiFi. Our team values sound quality most of all, that's why we prefer only Hi-Res music played on Hi-Fi speakers. Although everybody has their headphones, there's always good music around, because all of us have different but good taste in music. Our speakers. 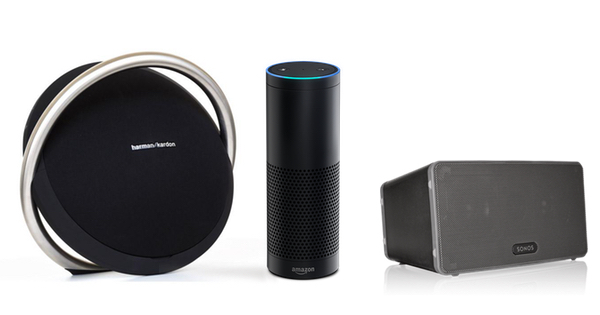 In VOX Office there're three speakers - Sonos Play:3 | Harman/Kardon Onyx | Amazon Echo. I will now tell you why we chose them. Sonos Play:3 is a WiFi speaker that is a perfect fit for our open-space office. It's only one speaker, but it supports FLAC, ALAC, WAV, and AIFF. These Hi-Res formats have frequencies about 1000-4000 kbps, that's why the sound is always neat and distortion-free. We control Sonos using VOX Music Player to be able to play everything we have in our libraries, and Sonos have their own Sonos Controller app, available for iOS, macOS, PC, and Android. Onyx is equipped with four drivers and dual passive radiators that create clean sound with crisp highs and deep lows. VOX Team loves deep lows for we usually listen to EDM while making VOX Music Player better. Onyx also has an app and works with WiFi, Bluetooth, AirPlay, and NFC. Onyx's design is different from other due to its stainless steel ring, which makes it looks like some Star Trek-ish loudspeaker. Love. We just like to talk to Alexa.